“Sherlock” Holmes has helped people, but no one more than himself – or rather, herself. Charlotte Holmes' new alias allows her the independent existence she’s craved as well as an outlet for her extraordinary talents. 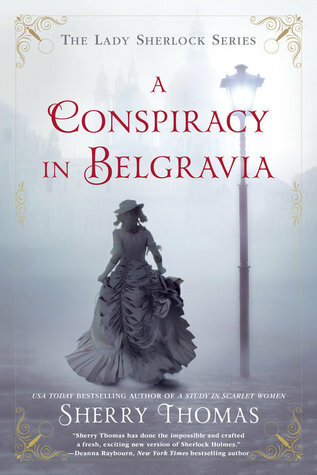 Fresh off the success of her first big case, professional and personal life suddenly collides when Lady Ingram, wife of Charlotte’s oldest friend and ally, employs Sherlock to locate a missing person – Lady Ingram’s first love. Torn apart years ago by class and family expectations, the pair has met once a year just to steal a moment’s glance at each other. This year, without warning or excuse, he failed to appear. Already wary of personal implications working this case may cause, the situation grows more complicated when evidence identifies Lady Ingram’s lost love as Myron Finch, Charlotte’s half-brother. But in this case, answers only beget more questions, and the road to the truth grows more dangerous at every turn. Once again, fabulous work by Sherry Thomas. I will say this over and over: I can’t get enough of the Lady Sherlock series! Again, a familiar story felt fresh and completely brand-new, and the suspense drove me wild. Just when I thought I knew what was going on, I'd turn the page and a new clue would shatter my theory to pieces. And again, I was delighted with the way Thomas’ characters’ interact and react, not just in relation to the case but in the larger context of Victorian society and gender politics. Where weaker historical fiction ignores those finer details and the characters just exist in this lame bubble that only makes sense (sometimes) for that particular plot and audience, Thomas gives us the full enchilada - a tasty, rich, addictive enchilada. Treat yourself. Trust me. I loved this novel. It was so engaging and grew in its complexity as the story progressed. If you liked Charlotte in the first book you will love her in this second one. I was on the edge of my seat the entire time I was reading this book. I loved the twists and turns,and overall it was absolutely fantastic.